They didn’t win their “Sen-ior Night” match. But Wood River High School volleyball players claimed a moral win Tuesday by winning one game over the five-time defending Great Basin Confer-ence tournament champions from Twin Falls. The Twin Falls Bruins, coached by former WRHS bas-ketball star B.J. Price, pre-vailed 25-20, 25-16, 22-25, 25-13 on the Hailey floor. Wood River coach Tim Ri-chards said the third-game vic-tory for the Wolverines was the first game lost by Twin Falls in a conference matche over the past two years. 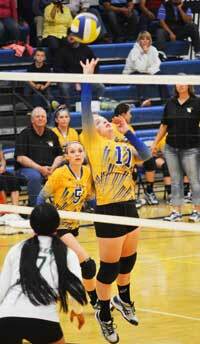 Wood River had 27 kills with 22 hitting errors for the match compared to Twin Falls’ 49 kills. Richards said, “Haley Cutler (8) led us in kills and Blair Rad-ford had another great match with 7 kills. McKenzie Garrison added 5 kills with 3 blocks. “Ciceley Peavey (21) was our dig leader. Liz Forsling and Haley Cutler had fantastic saves and defensive digs, 11 and 10 respectively. Brittney Bradley (18) led our assists. Wood River (20-15, 5-4 league) is seeded third in the six-school GBC tournament starting Monday, Oct. 20. The Wolverines play either Burley or Minico in their first match Monday at 5 p.m., most likely on the Canyon Ridge court in Twin Falls. The nine-school District 1A Division 2 tournament begins Saturday, Oct. 18 at Dietrich with the teams aiming to de-throne two-time defending state champ Lighthouse Chris-tian Academy of Twin Falls. Four opening-round varsity matches are scheduled starting at 3:30 p.m. The Carey School Panthers (7-11, 2-6 league) dropped their “Senior Night,” match to Han-sen 25-18, 25-16, 26-24 Tuesday night and made a trip to Oakley for the non-conference regular-season finale. The Community School Cut-throats (1-10, 0-8) completed their league schedule with a 25-12, 25-9, 25-13 loss to Dietrich Tuesday. The Cutthroats host Twin Falls Christian Academy today, Friday at 6 p.m.